This is a contributed post from Content First, an ActiveCampaign Certified Consultant. Winning more customers and driving business ahead faster. What if I told you that a literal “blueprint” for the optimal communication pathway for trust and relationship building has been discovered. (At Content First, we first rolled out this new framework in 2017 for one of our childcare clients, and it drove over $16M in annual revenue – with a 11,762.52% ROI on marketing spend). Shout out: Credit where credit is due—as a Digital Marketer Partner we were introduced to the Customer Value Journey by Ryan Deiss and the talented team at Digital Marketer. They introduced us to the framework and in this article we’re going to explore how we’re applying it to our childcare clients (and getting them great results)! The Parent Value Journey has become our go-to planning framework for assessing how effectively our client’s communication strategy moves parents from being ‘cold prospects’ right through to becoming ‘raving fans’ of the business. 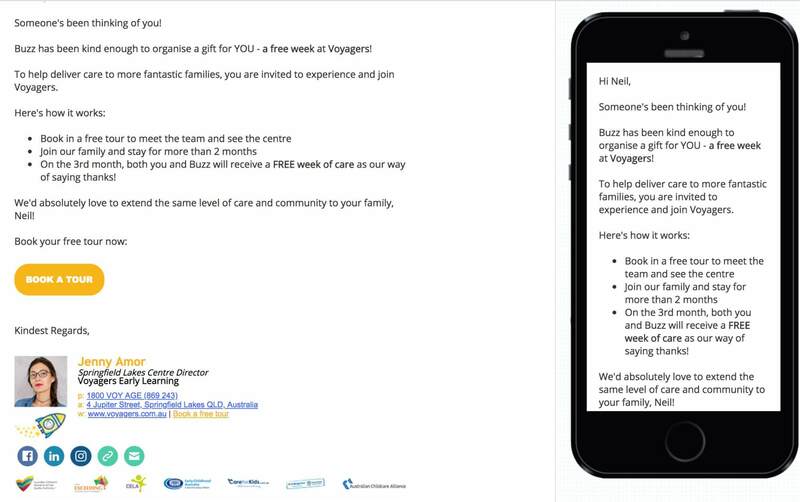 The ultimate goal of the Parent Value Journey is to drive enrollments into the centre, and support customer retention. In other words, revenue. When opening a shiny new childcare centre, clients can often get to 50% enrolment in the first 6 months, but without a smart marketing strategy in place the next 50% can be harder to acquire—not to mention the opportunity cost of this taking 12-18 months vs 8-9 months. 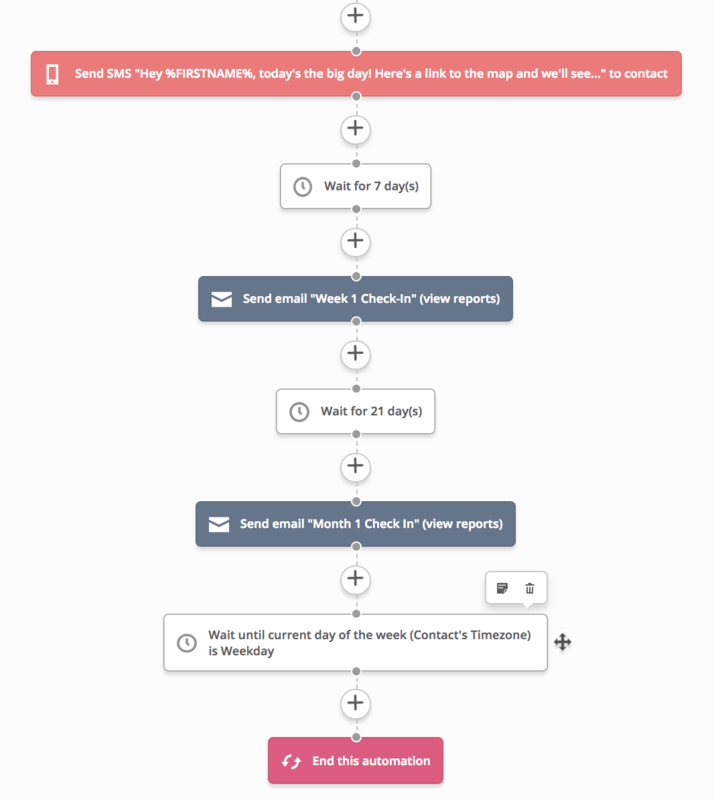 Let’s take a look at the specific stages of the journey and how we’re using ActiveCampaign to move parents through this funnel. 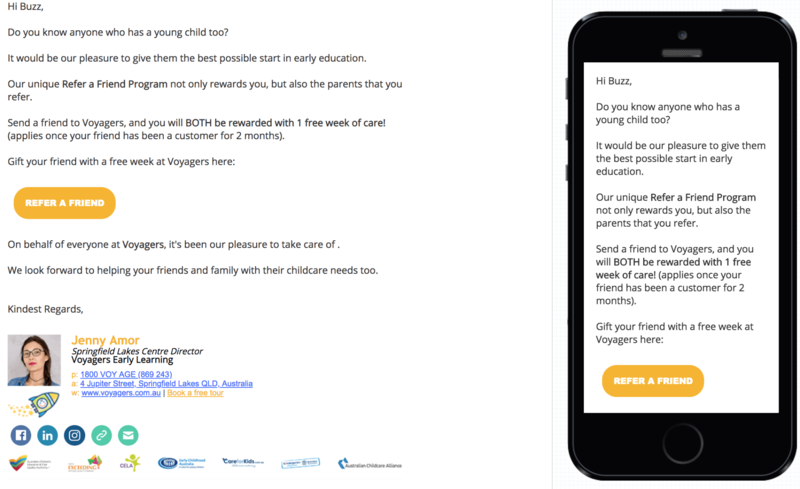 Since email continues to deliver some of the strongest ROI amongst all marketing channels, we emphasize the need for our childcare clients to build their email database of parents in local areas and begin opening relationships. 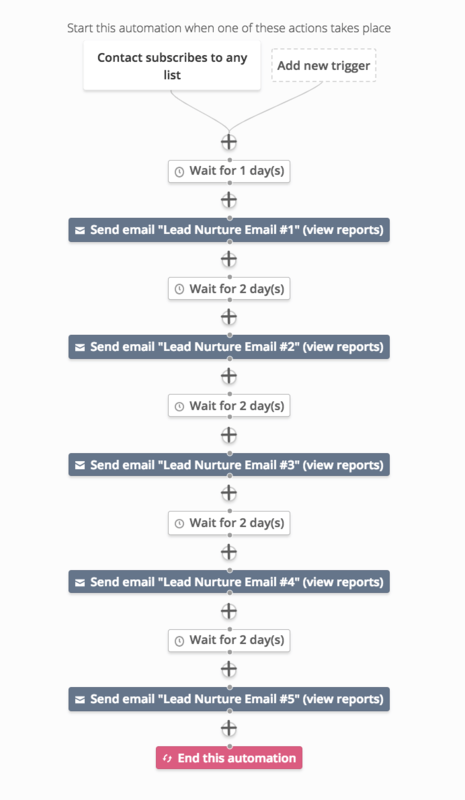 Email newsletter subscribers are integrated into ActiveCampaign and tagged with ‘Joined Newsletter.’ We also add them to a specific deal stage in the sales pipeline which means they’re not ready for the sales team to engage, but we should keep nurturing them. Parents get instant access to the Parent Handbook with the help of ActiveCampaign. New requests get tagged ‘Requested Parent Handbook’ to trigger automation. 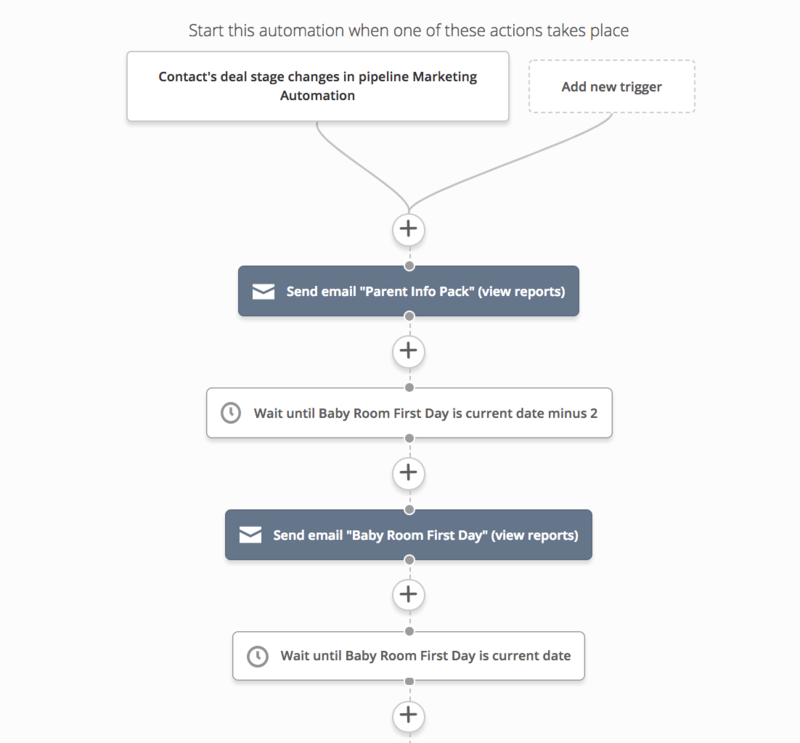 With this automation, we create a deal and add it to a specific deal stage pipeline (below). This stage indicates to centre directors that this is a new lead in their sales pipeline, but they are still in the nurturing stage. 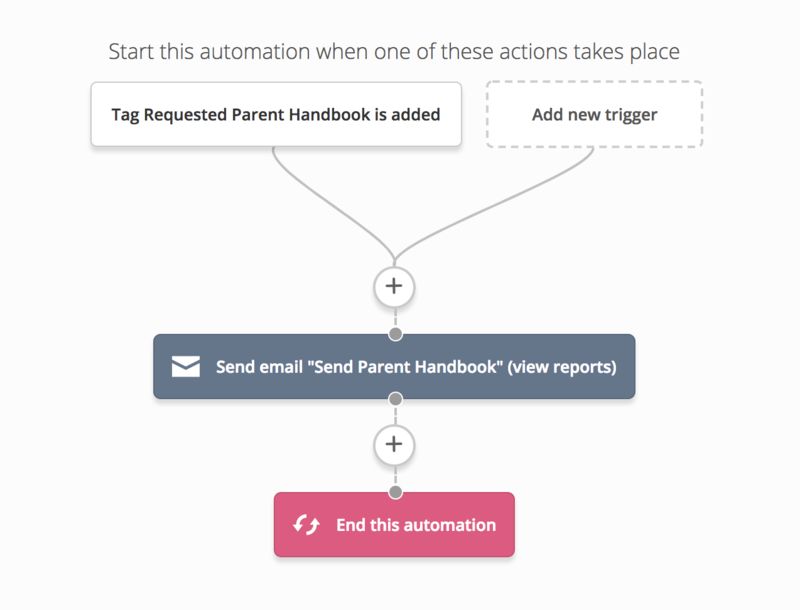 This automation instantly sends our clients’ prospects access to the Parent Handbook. The fastest way to a new enrollment is getting prospective parents into the centres. Meeting the team, seeing the facilities and getting a feel of the vibe of the centre is crucial, so in our digital marketing the focus is on booking parents into centre tours. Of course, some parents will be ready to enroll or join a waitlist without seeing the centre (and we use strategies to capture these parents too), but they are more the outliers than the typical. 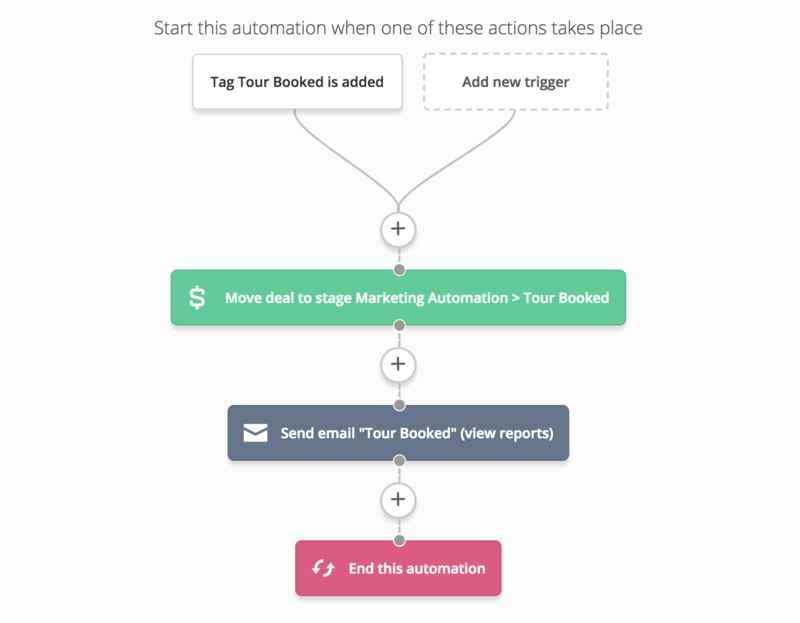 Book a Tour forms on the client’s website are integrated right into Active Campaign to support Centre Tour confirmation emails, Tour reminders and automated Tour follow-ups. We created the following custom fields to help us manage the Centre Tours. Then our automation moves the deal across to the ‘Tour Book’ stage so Centre Directors have a visual on who’s booked in. Finally, the automation sends the parent a Tour Confirmed email. Getting parents to attend tours is crucial, so we make sure we remind them every step of the way. We start by sending a reminder 1 day before, using the above logic. With a handy SMS that gives them a link of Google Maps to make it super easy to find the centre. Once we’ve had a parent attend a tour, then the focus switches on either having them apply for an enrollment or join a waitlist (depending on the occupancy level of the centre). Ideally the team in the centre have done such an amazing job during the tour that parents are fighting for a spot. Other times, parents are looking at other centres or might not be quite ready to make a decision. 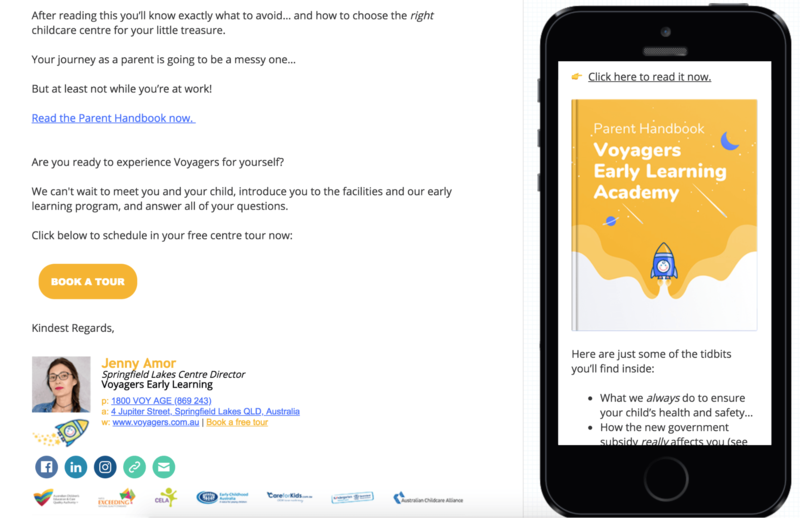 Our induction email series is designed to educate parents on the benefits of enrolling their children in our clients’ centres. The goal of this sequence is to have parents ‘know’, ‘like’, ‘trust’ and ‘commit’ to enrolling with our clients. We personalise this for parents based on whether they have attended a tour. 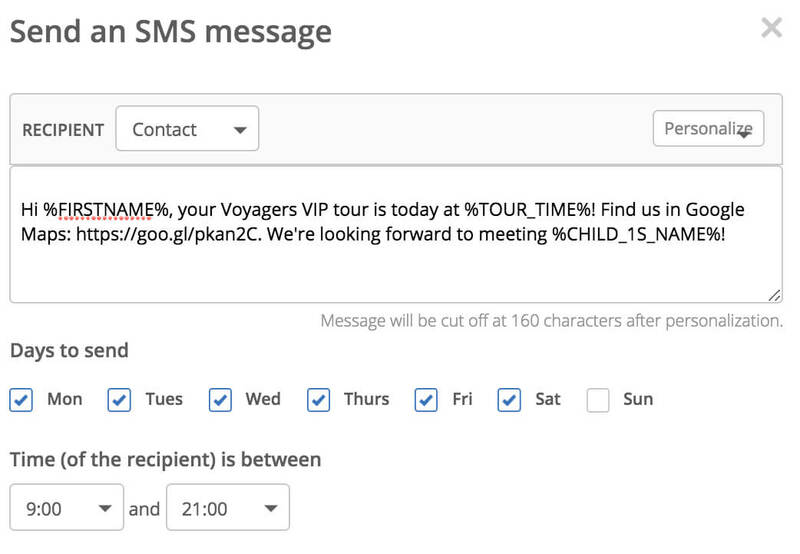 If they have attended, we tag the parent ‘Tour Attended’ then we can optionally show content in our email creative. 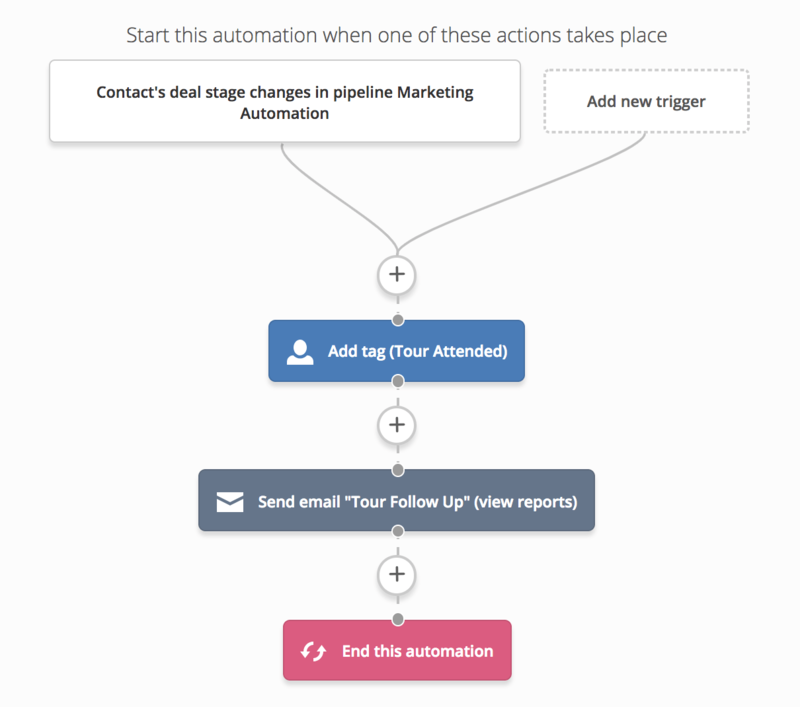 This makes sure we are prompting them to the most logical call to action for their stage in the sales process. Once a parent has attended a tour, we make it super easy for centre directors to move them down the sales pipeline. All they need to do is move them to the stage ‘Tour Attended’ to trigger automated follow up (and trust building). 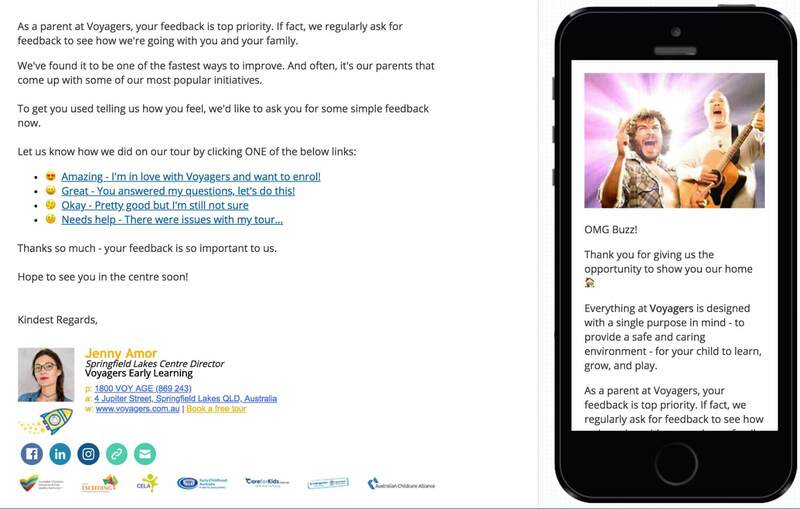 Then we send a follow up that does a couple of important things, 1) it asks for the parents’ feedback, and 2) it conditions parents that we’re going to continually ask for feedback to improve. This builds trust, helps parents feel like their voice will be heard, and finally, makes it easier to get testimonials and referrals down the track. 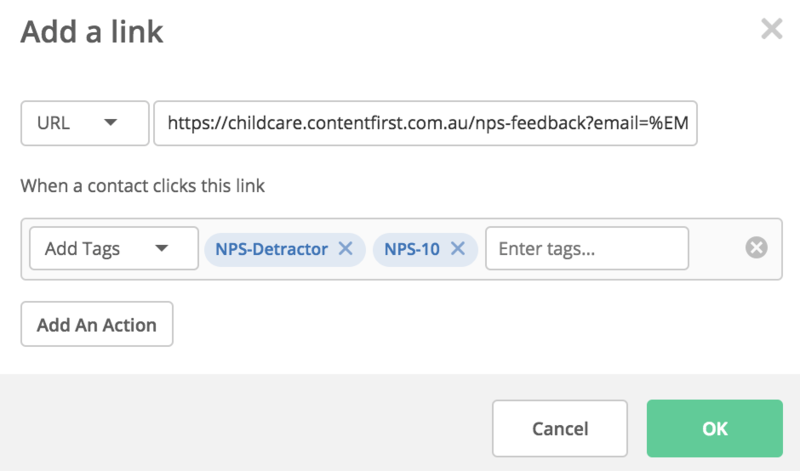 When a user clicks on one of the feedback links, we tag the user with the level of feedback they gave. This gives the client teams visibility of their sales performance, and allows us to roll up the feedback on reporting dashboards. 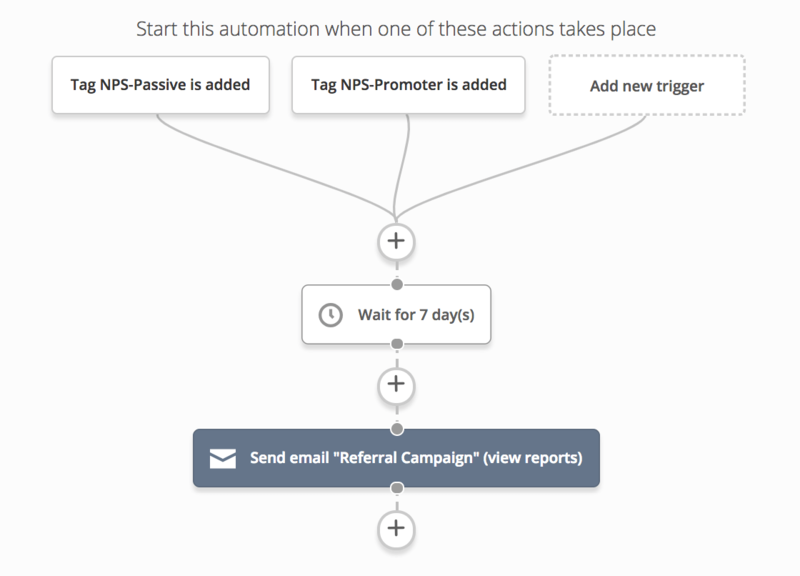 Note: this then triggers both follow up sequences AND tasks for the client teams to follow up appropriately. Now we’re at the peak of the conversion summit and the goal of what all our childcare clients want to do – get more enrollments. This is so important to our clients, that we even created the Double Your Enrollments Checklist, which breaks down our strategies across the 8 stages of the Parent Value Journey and 13 digital channels. Driving enrolments is obviously important, but keeping enrollments also deserves significant time and energy (we all know getting a new customer is more expensive than keeping one). Let’s say the parents attend a tour and fall in love with the centre. One of two things can happen. Scenario #1. The centre has no occupancy in the studio and the parent needs join a waitlist. In this case, a couple of things can happen. 1a. In centre, the parents could express interest to be on the waitlist. In this case, the client team simply drags the deal to ‘Confirmed Waitlist’. 1b. In the centre, the parents aren’t sure. In this case, the client drags the deal to ‘Sent Waitlist Offer’. 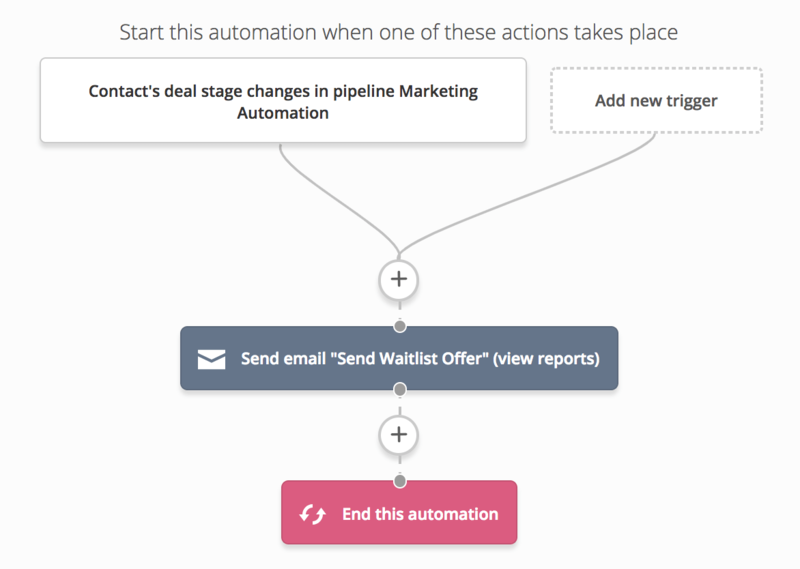 In this scenario an automation triggers to send them an email to offer them a place on the waitlist. 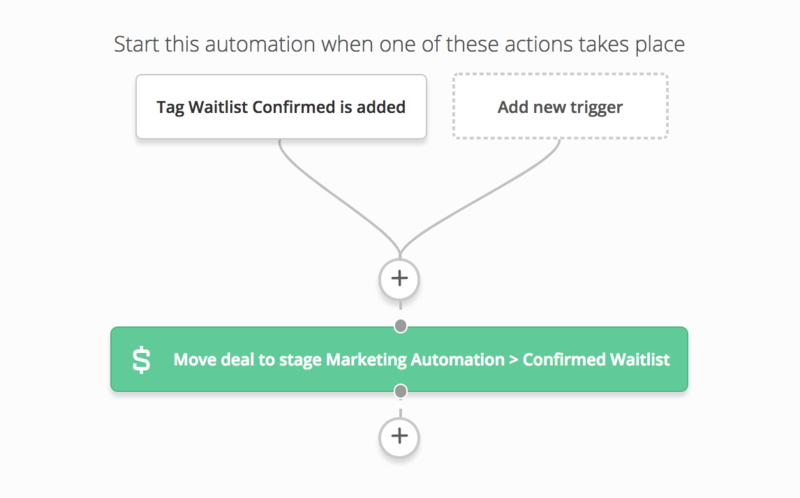 If the parent clicks a button in the ‘Send Waitlist Offer’ email, they are added to the next automation, which add them to the deal stage ‘Confirmed Waitlist’. Scenario #2: There’s a space available for the child. In this case, we handle the full enrolment process via forms on the website and Active Campaign. Here the client team member will move the deal to ‘Sent Enrolment Offer’ to trigger a series of automations. The parent is directed back onto the website to complete a full enrollment form. At this point sometimes we need to take payment for a deposit (some clients skip this step). Once the form is completed, this automatically moves the parent deal to ‘Enrollment Form Complete’ or ‘Enrollment Confirmed (deposit received), depending on the set-up our client wants. Now, this step sends an email confirmation that their enrolment is complete, and the parent can relax and wait. But don’t forget those follow ups we setup when we triggered the enrolment form to go out. 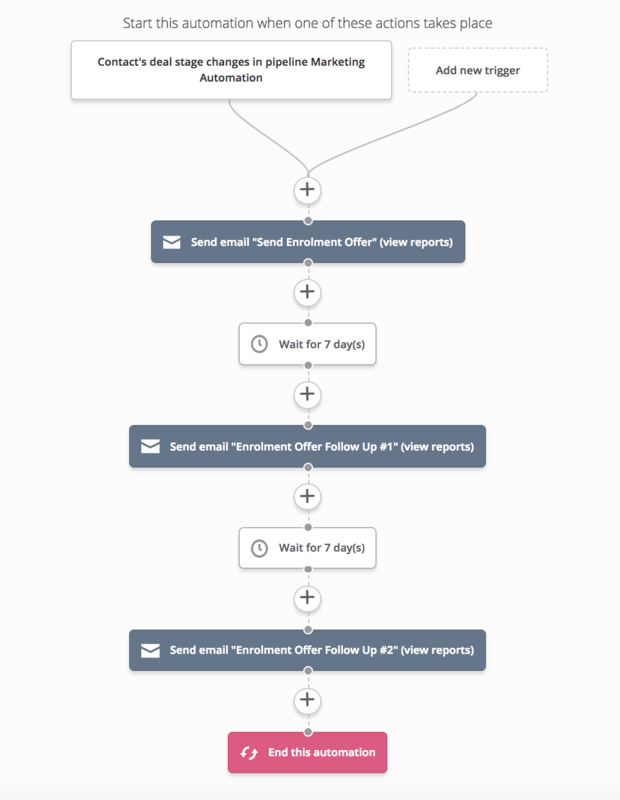 Once an enrollment is complete, we send the confirmation email, and we also END the ‘Enrollment Offer’ automation – to stop further follow up emails being sent. Once a parent becomes a customer, the job turns to onboarding. 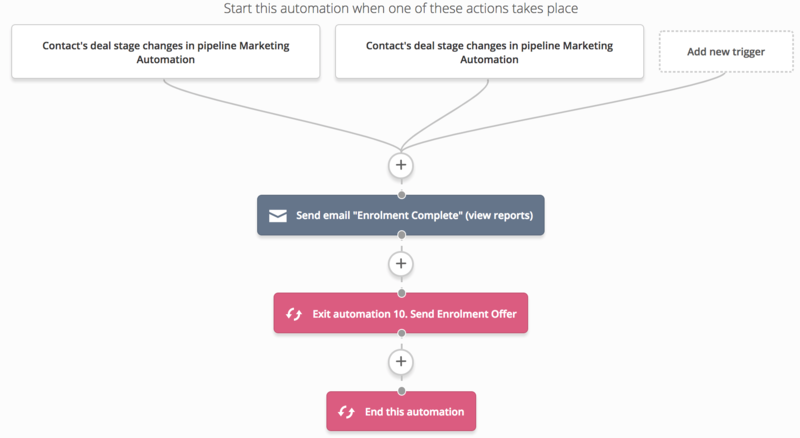 Using a similar logic to the above stages, we give clients the simple power to drag a deal across to onboarding to trigger an ‘onboarding’ automation series. Once we have happy customers, we seek out positive word of mouth. More than ever, local parents are carefully reading reviews on Google and Facebook when making decisions about where to enroll their child. Our Advocate stage takes a quarterly 2-stage approach to get a pulse check of customer satisfaction, generate positive word of mouth, and safeguard against negative online reviews. Every 90 days parents are invited to give feedback to the centre. 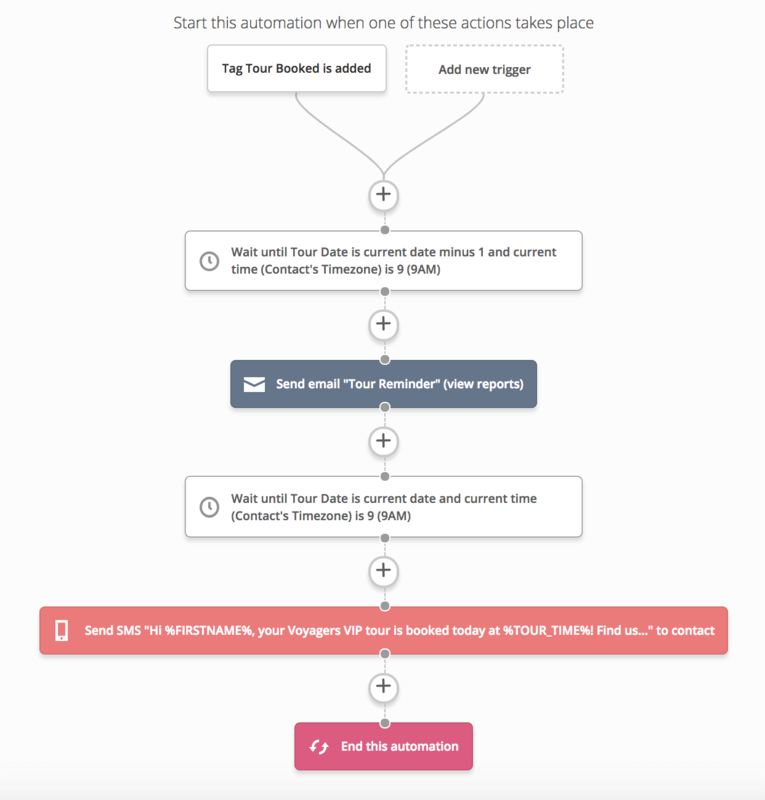 This automation loops every 90 days to keep getting feedback from parents. 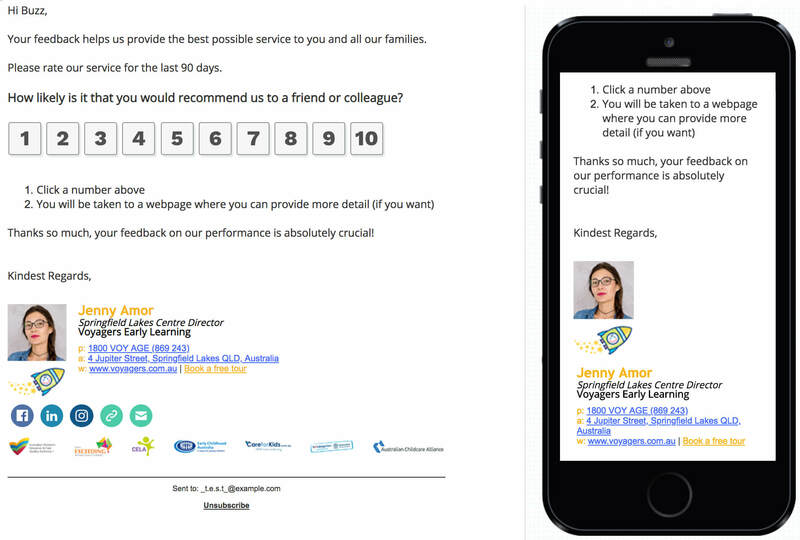 When a user click on one of the numbers, we sent them to a webpage to provide more feedback. Users are tagged as a ‘detractor’, ‘passive’ or ‘promoter’ based on the scores they give. 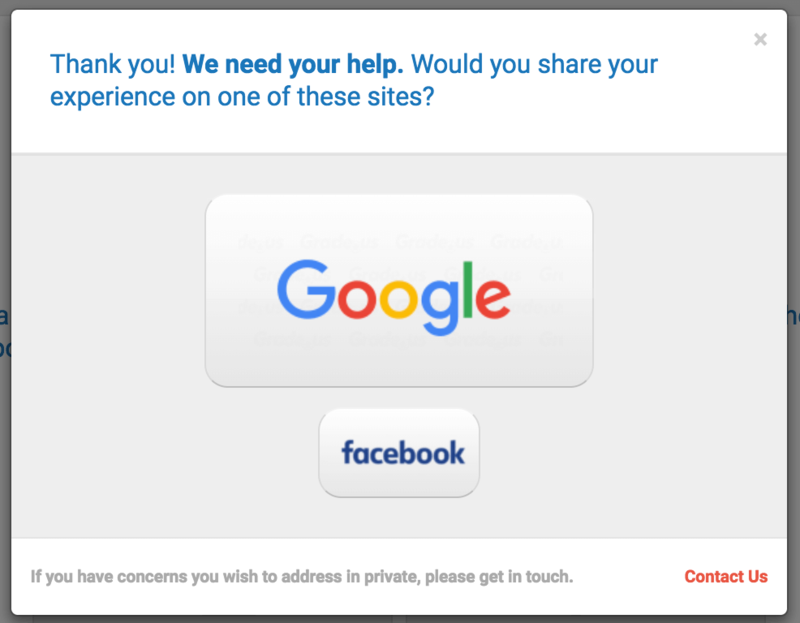 We then send users to a form on a webpage where the parent can give more feedback (should they want to). Next, if the parent was tagged as a ‘promoter’ we then ask them to share their positive feedback with other parents on either the centre’s Facebook Page or their Google My Business listing. Finally, we have happily enrolled parents who are brand advocates. Our last step to make the most of the relationship is to help them become active promoters of our clients’ childcare brand. Our referral campaign is triggered ONLY for parents that provide a 7 or above rating on our NPS survey. We wait 7 days, and invite happy parents to invite their friends and family. 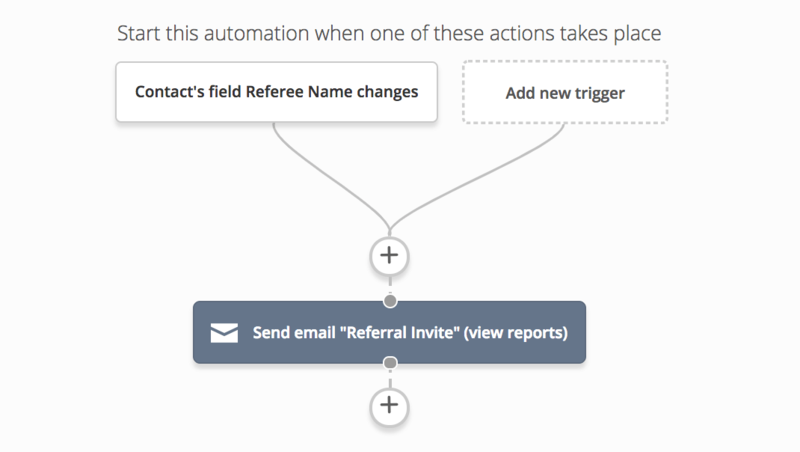 On the referral webpage, we give parents a form where they can enter their friends’ names and email addresses. Completing this form triggers an invitation sequence to get delivered to the parent’s friends. We also capture the parents who referred the new parents in custom fields (so we know who to reward). The updating of this field triggers automated campaigns to invite the referred parents to visit our clients’ centres. Which then triggers a referral invitation to the parent’s friend or family member. It’s important to measure the performance of both our front end marketing campaigns (filling up the Parent Value Journey with new parents), marketing automation campaigns (moving parents through the Parent Value Journey), and our clients in-centre sales performance (results of centre tours and the enrolment process). For a full breakdown of how we build these dashboards for our clients, read our post [solved] Cross Channel At-A-Glance Digital Marketing Dashboard for Executives Feat. Google Data Studio & Google BigQuery. Wondering how your childcare digital marketing is performing? Are you running a childcare business? Get your hands on real benchmarks for high performing childcare digital marketing covering all the metrics we’ve discussed in this post. Download our free Double Your Enrollment Checklist now. We know that attracting new customers each month (and keeping them as customers) is the lifeblood of all businesses. If you or someone you care about runs a business and wants more sales, the team at Content First may be able to help. We’d got a special free offer just to friends of ActiveCampaign – we’re opening up a few spots for a complimentary Growth Planning session, where we’ll help you assess the fastest way to grow your monthly sales. Click here to learn more and book in your spot.